While the accessible price point of the vehicles in this segment was and still is one of the main attractions for young and/or first-time car buyers, it wasn’t enough just rolling out another upmarket compact model with some the bells and whistles. What buyers are after are the quality of the features and not some run-of-the-mill offerings. According to Huppenbauer, the new compact model is in response to such demands. “The fourth generation A-Class delivers all that, and more, in a compelling package that boasts contemporary design and an intuitive operating concept. 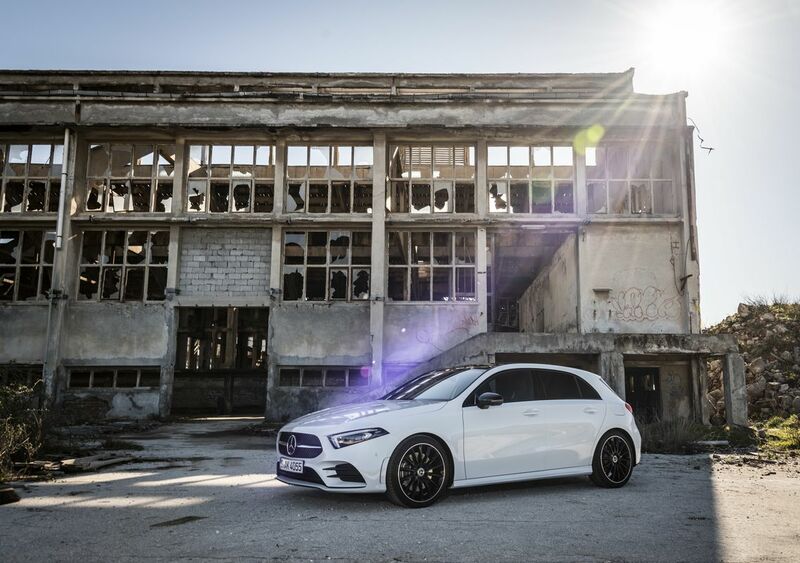 The new A-Class with MBUX surpasses all expectations of a compact hatchback and harnesses the power of its artificial intelligence to create a personalized driving experience every day”. So, what’s all the rage about the new A-Class? Here’s a quick rundown. The three variants, A180, A200, and A250 inherited the longer wheelbase with the front hood slopping down more heavily than the outgoing model for a more dynamic and sportier silhouette. Other upgrades included larger wheel arches for wheels from 16 to 19 inches. These emphasise the sportiness of the new A-Class and make it sit more squarely on the road. Another striking feature is the radiator grille with Mercedes star. The silhouette opens out towards the base reminiscent of its predecessor, features pins in a diamond look and a central silver louvre to underline the sportiness of this model. According to Gorden Wagener, Chief Design Officer Daimler AG, “The new A-Class embodies the next stage in our design philosophy of Sensual Purity and has the potential to usher in a new design era”. Inside the completely redesigned cabin, an avant-garde dashboard with a cowl above the cockpit that runs uninterruptedly from one front door to the other. The completely free-standing sleek widescreen display matches the set of sporty turbine-look air vents. The 64 colours ambient lighting adds a modern feel to the aesthetic. The display comes with a 10.25-inch (26cm) all-digital instrument cluster and a 10.25-inch (26cm) central media display with touchscreen operation. The new changes to the A-Class also included more shoulder, elbow, and headroom with a larger and more family- and recreation-friendly luggage compartment. The capacity of the luggage compartment behind the rear seats is 370 litres –29 litres more than in the preceding model– and the luggage compartment floor is 11.5 cm longer. The overall interior design also reduced areas obscured by the pillars by 10 percent as compared to the last model. You can also opt for the Multicontour Seat Package with a massage effect for the front seats and electronically adjustable side bolsters and lumbar support. MBUX – Mercedes-Benz User Experience, is an innovative feature with artificial intelligence that allows the system to learn your preferences. The high-resolution widescreen cockpit with touchscreen operation offers quick media and navigation display control. The system also offers intelligent voice control with natural speech recognition, activated with the code word “Hey Mercedes”. A head-up display is also available. The new A-Class has inherited the very latest driving assistance systems with cooperative driver support with functions adopted from the S-Class. The feature allows the vehicle to drive semi-autonomously in certain situations including automatically maintain the correct distance from the vehicle ahead, and offer the driver steering assistance, even on bends. The all-new A-Class offers three efficient four-cylinder petrol engine configurations that produce respectable figures. The A 200 is complete with 163 hp and a 7G-DCT dual-clutch transmission setup. The combined fuel consumption registered at 5.6 l/100 km with CO2 emissions combined 128 g/km. The A 250 also shares the same 7G-DCT dual-clutch transmission delivers 224 hp with a combined fuel consumption at 6.5 l/100 km and CO2 emissions combined at 147 g/km. The A 180 setup also inherited the same transmission system with 136 hp. Fuel consumption combined at 5.4 l/100 km and CO2 emissions combined at 124 g/km.